Suwanee, Ga. (October 31, 2013) – Rugged Ridge® today announced the availability of its new Rear Seat Organizer for 2011 – 2014 Jeep JK Wrangler, with a patent-pending design offered in both black and tan, for two and four-door models. This newest organizer from Rugged Ridge builds upon the launch of its similar organizer designed for 2007 – 2010 Jeep JK Wranglers, marrying convenience and style into one unique design. The perfect solution for Jeeps cluttered with any number of miscellaneous items, Rugged Ridge’s Rear Seat Organizers feature enclosed storage areas that safely and securely confine toys, drinks and other wayward trash that can build up over time. Constructed of a sturdy molded plastic and designed to match the color and texture of the Jeep’s factory interior, the Rear Seat Organizer measures just 11x10x10-inches and is built to discreetly complement the OE interior design of the Jeep JK. 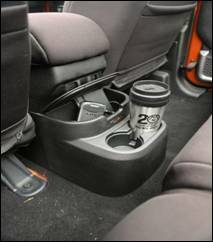 Featuring a unique removable double walled lid to prevent objects from blowing away or falling out, each organizer is engineered to easily install and instantly fit into the rear cup holders of the ’11-’14 Jeep JK. Starting at $39.99, each Rugged Ridge Rear Seat Organizer is backed by an industry-leading five-year limited warranty and is available through select online retailers. For additional information about Rugged Ridge’s complete line of high-quality Jeep and off-road products, or to find an authorized retailer, please contact Rugged Ridge at (770) 614-6101 or visit its website at www.RuggedRidge.com.